There’s no question that smartphones have become a ubiquitous part of our daily lives. Studies have shown that 46% of Americans reach for their phones first thing in the morning, while 91% of people automatically reach for a mobile device to check on something when doing a task. Essentially, these are the critical points where someone takes to their device (which is most often a smartphone) and takes steps regarding a need. It’s the intersection of what a customer wants and needs at the moment and what they know. Google has determined four key moments based on the consumer: “I want to do,” “I want to know,” “I want to buy” and “I want to go.” Most decisions made by shoppers can be traced to one of those four moments. For instance, a shopper who’s headed to Turkey would research on what to “do” in that country. A travel agency can come up with a promo that will arrange a trip to Istanbul’s famous Blue Mosque. It pays to ensure that your business profile is accurate and completely filled out on Google, particularly if you have a physical storefront. There has been an increase in “near me” or “right here” searches, as more users are looking for a place to go for a certain activity. Getting your business profile up will help with micro-moments where a customer wants to “do” something or “go” somewhere. Google’s Local Guides program assists users in verifying if your profile information is accurate. The need to know is one micro-moment that could hit you several times a day. This is why people are always looking for content on eCommerce sites. Having unique and relevant content is a great way to introduce your business to shoppers who are searching for information on either a particular product or on something that has captured their interest. Regardless of whether it’s a short how-to video or some DIY tips, make sure to flaunt your value by offering good content that appeals at the moment. Speed is key if you want to use micro-moments to your advantage. When asked, almost half of customers admit that they will leave a website if it’s unresponsive or takes too long to load. People also don’t like having to go through different windows or steps just to get information. Optimizing your site for mobile devices and streamlining your buying process is a good way to entice consumers to go to your page and stay. Another area that brands should focus on is how the user experiences their website and content. When a potential customer goes to your site or a specific page, what will they see? Will they be able to find what they’re looking for quickly or are they going to spend time wading through redundant information? Aside from ensuring that information is accessed quickly, transactions should also be simplified. Complicated checkout pages or a cart that requires several clicks in order to finish a purchase will turn consumers off. There should also be fewer distractions on the checkout pages, especially those on mobile devices, as these further cut down the odds of conversions. The goal is to make shopping quick, fun, and simple. 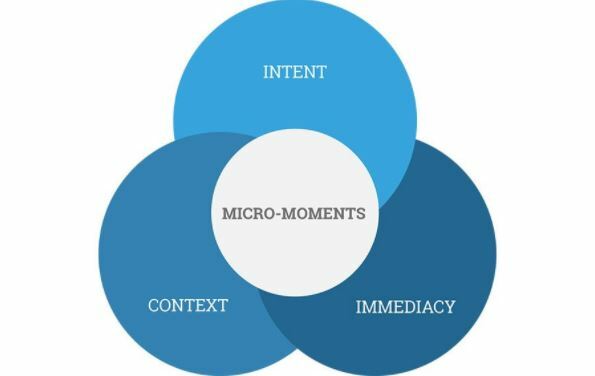 Companies have to be ready to take advantage of micro-moments. This means that business has to do some forward thinking to anticipate what their customers would need. Changes may also need to be made to ensure that websites are optimized for mobile.